American Idol canceled after 13 years. Next year will be its last. We seriously never thought this day would come! •	"American Idol will begin its 15th -- and final -- season this January on FOX. 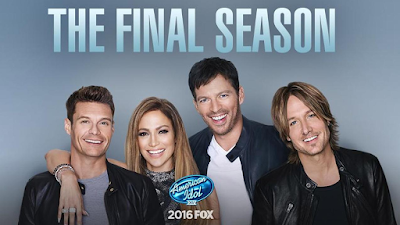 A season-long celebratory event, American Idol XV will feature host Ryan Seacrest and judges Jennifer Lopez, Keith Urban and Harry Connick, Jr., as they search for the final Idol superstar and pay tribute to the past 14 seasons of amazingly talented contestants and the millions of fans who tweeted, texted and championed their Idols." While the news seems shocking, the show's numbers (and massive production cost) make the decision a bit more understandable. Back in 2006, Idol drew in a whopping 36 million viewers for its season finale, but Entertainment Weekly reports that this year the show only snagged 11.6 million viewers (including DVR playback). As far as the expenses, think of how much money Jennifer Lopez and company are making on the hit show -- and how much of the budget is used up when the team travels all over the United States looking for contestants. Ryan Seacrest has hosted the show since its June 2002 premiere, and the first round of judges were Paula Abdul, Simon Cowell, and Randy Jackson. Since then Kara DioGuardi, Ellen DeGeneres, Jennifer Lopez, Steven Tyler, Mariah Carey, Nicki Minaj, Keith Urban, and Harry Connick Jr. have been added to the lineup. Despite the fact that the show has become a sinking ship as of late, the series launched the careers of stars like Kelly Clarkson, Jennifer Hudson, Adam Lambert and Carrie Underwood, and it definitely paved the way for other reality competition shows like America’s Got Talent and The Voice.